This being a World Cup year, there's plenty of games looking to cash in on the hype and grab the title of the summer's best sports tie-in. 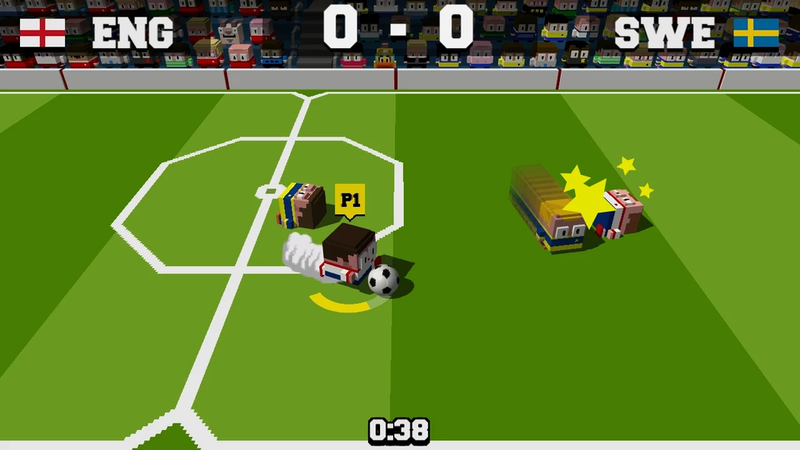 Indie developer Atooi - of Chicken Wiggle fame - have chipped in with their effort Soccer Slammers. Unfortunately, far from claiming the golden boot, it barely makes it through the group stage. The name of the game is 2 vs 2 arcade action. FIFA it ain't, and the final scoreline of each match resembles those usually found in rugby fixtures rather than the beautiful game. Each half lasts a minute - though with stoppages every time a goal goes in, this can often actually be more like 3 or 4. The reason the back of the net bulges so often is because it's just so darn easy to score. Rifling home a winner simply requires a fully charged shot from literally anywhere on the pitch. As long as it's on target, 99% of the time it's going in. There are keepers, but they're so utterly useless you're left wondering why the developer bothered including them at all. Shooting is done using the A button, and the longer you charge it the more powerful the shot. Fully charged it rockets across the pitch with a satisfying swooshing sound, leaving a trail of flames in its wake. It does feel rather awesome at first to power home these insane shots. Unfortunately, because it's so damn easy to score, that pleasure soon wears off and any joy to be gleaned from hammering the Germans 18-0 is all but washed away. Defense is handled by the Y button, with your player slamming into your opponent (assuming you're in range). There's no fouls or free-kicks, and the pitch is enclosed much like an indoor footy pitch, so the action never lets up. This means that if you can successfully incapacitate both opposing players in one tackle, you'll have all the time in the world to unleash your right foot. Your teammate will help out by treating your opponents to a crunching challenge too, though, while not quite as brain dead as the keepers, they can't be relied upon to make the obvious move all the time. Passing to them is a waste of energy as well. They'll likely unleash a pathetic shot directly at the goalkeeper (the only time they'll manage to save anything). There is plenty of fun to be had by powering home insane winners from all corners of the pitch, as the dormant Mario Strikers franchise can attest, but given the dull loop of slide tackle, charge shot, goal Soccer Slammers falls into, single player gameplay quickly becomes tedious. There isn't even much reward in winning the World Cup, just a generic 'congratulations' screen. Given that the presentation is actually the game's strongest asset, it's a shame a blocky World Cup replica trophy didn't show up for the victorious. And the presentation is decent. The players and pitch all look cool, and the way they go slightly bog-eyed after being lamped by a sliding tackle is as funny as it is charming. Every team has both home and away kits too, which is a nice touch, and the crowd sounds add a genuine atmosphere to the matches. It does feel a little empty in this type of game to not have some music on during the action, but given how quickly the menu music becomes irritating, this is probably a blessing in disguise. There were one or two moments where the game flipped out a bit, where players just ran into walls, or goals that should've registered at one end were miraculously transported to the other. This lack of polish smacks of a game that was maybe rushed a little in the final stages in order to launch in time for the real World Cup. Every country competing in Russia is included, as are some that weren't lucky enough to qualify such as the US, Italy, and Wales. There's also a Mutant Mudds team which is particularly cool, though it's a shame more Atooi franchises aren't included or unlockable. Totes the Goat seems perfect for Slammers' blocky aesthetic, and I daresay Chicken Wiggle would've made a fine centre forward too. There is a little more fun to be had in multiplayer, and this is clearly the primary reason for the game's existence, but unfortunately the gameplay is equally as shallow, and players just don't move fast enough - even with using the sprint button - to make stringing together some tasty passes possible or worthwhile. If you want to win, you're best served by firing off shots early and often, regardless of how many JoyCon are in play. Soccer Slammers certainly looks cool from the outside. The unique artstyle wins you over instantly, and with every World Cup team included - as well as a few extras to boot - you'll be able to fire home a dozen revenge goals against whichever side knocks out your home nation in this summer's tournament. Unfortunately, the core gameplay is incredibly dull, even in multiplayer, and you're unlikely to glean much enjoyment from it for more then 20 minutes or so.